It’s a sobering fact that three-quarters of schools in the UK are reported to contain asbestos materials in their buildings. In the decades after the Second World War, particularly between 1945 and 1975, the UK’s school building programs heavily used asbestos in the construction of thousands of buildings. In fact almost 14,000 schools built during the period used the material, whether it was for the construction of temporary prefab buildings on site, or even thermal insulation. Asbestos was only officially declared dangerous as a construction material as late as 1999. To make things more contentious, many of those buildings are now old and coming to the end of their useful life, meaning they’ll have to be taken down at some point. The problem with this is that it risks exposing more and more people hazardous asbestos fibres on the premises. Just how serious is asbestos in schools? Councils in England and Wales have paid out £10 million in compensation because of asbestos in schools. The National Union of Teachers (NUT) suggests that up to 300 people are dying every year due to exposure in schools, many of these being former pupils suffering as adults with illness such as mesotheliomas. Barely a month goes by now without this being featured a serious item in national or local news. Where can asbestos appear in schools? Asbestos was at one time considered a very useful material in many parts of construction. It can indeed be found in many different parts of the school, notably ceiling tiles, floor tiles, cement roofing (and the gutters) as well as textured coatings. Asbestos was also used in insulation for boiler wraps or pipe-wrap insulation, as well as insulation boards and fire protection in other places. Of particular concern is when the asbestos is ‘friable’ material, as is the case with schools. Friable asbestos can essentially be crumbled or powered by an ordinary human hand, and they release easily inhalable fibres. If you work for a school and you’re concerned about the prospect of asbestos in construction materials or buildings, then in the first instance it’s important to contact a qualified asbestos removal professional. That way the scale of the situation and the risks to pupils and staff can be properly assessed. The Health and Safety Executive puts the responsibility for managing the risks of asbestos upon schools themselves. The first stage is to conduct an asbestos survey of your school to ensure that pupils and staff aren’t being exposed to fibres, before any remedial work takes place. This could result in buildings being closed temporarily. But the remedial work could also take place over summer holidays to avoid disruption – as was the case when we worked at Littleover Community College. 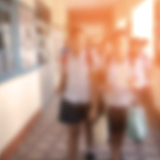 Although funding remains an issue with various educational authorities, and the government is currently developing better guidance to educational facilities, the schools themselves still have a duty to the safety of their staff and pupils. The government recommends that if asbestos is undamaged and managed safely, then the presence of asbestos in school buildings does not necessarily pose a significant risk.